Shaz by the Sea: Cleaning Out the Fridge! Jim and I are preparing for our trip to Boston for Thanksgiving next week and we are SO excited. I am excited to be home, excited to get away from work for a few days...but I am not excited about the actual travel since we are taking the red eye the night before Thanksgiving. Ugh, wish us luck. Over the last few weeks, I have been piling up some items so I don't forget to pack them. For example, I forgot my mom and dad's birthday cards in September, so I already threw those in my suitcase. I packed up my peacoat, a few sweatshirts, my UGG boots, etc. Today, I decided to look through the fridge to see what perishable items needed to be eaten/cooked/tossed prior to our trip. 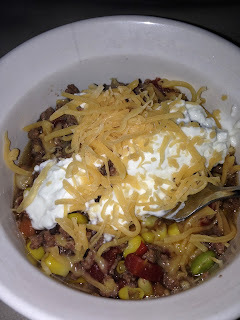 I noticed we had typical veggies such as red peppers, onions, spinach, baby carrots...as well as some shredded cheddar cheese and ground beef that I know won't last while we are away. BAM! 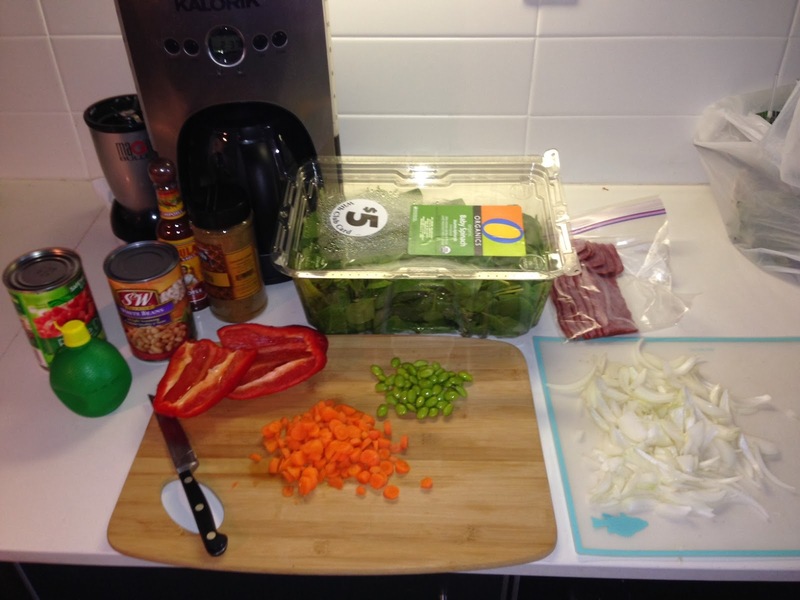 I will make some chili. I have been trying to eat more protein, so I can make that happen by throwing in a bunch of different beans (black beans, white beans, garbanzos...whatever I have). Last night, I cooked up some edamame, so I figure I can pop those suckers out of the shell and toss them in, too. Why not? They will add some nice color, as well as fiber. I also noticed I had some fresh salsa from Trader Joe's that won't last much longer, as well as some opened turkey bacon from over the weekend. I decided to just throw everything in together. 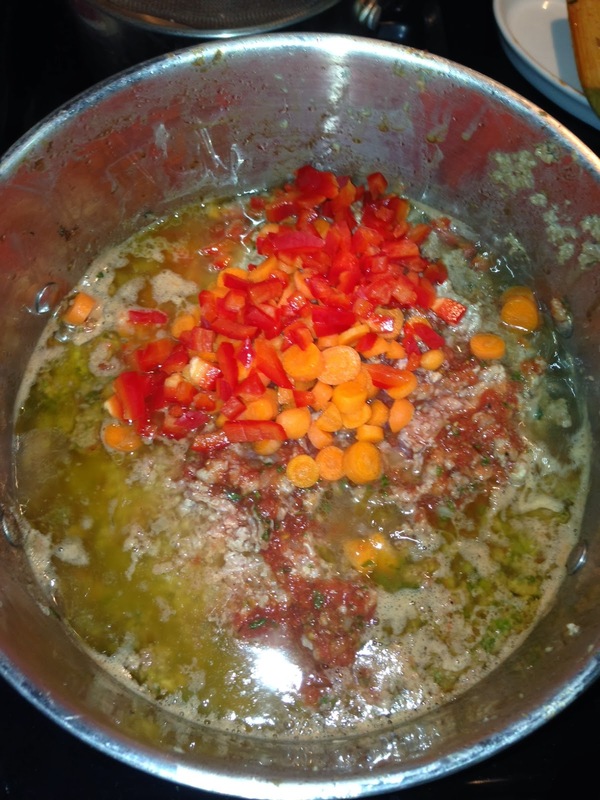 As far as non-perishable items are concerned, I always keep a few canned diced tomatoes in the pantry, as well as various beans, chicken/vegetable broth and other seasonings, like cumin that I will add to the pot. 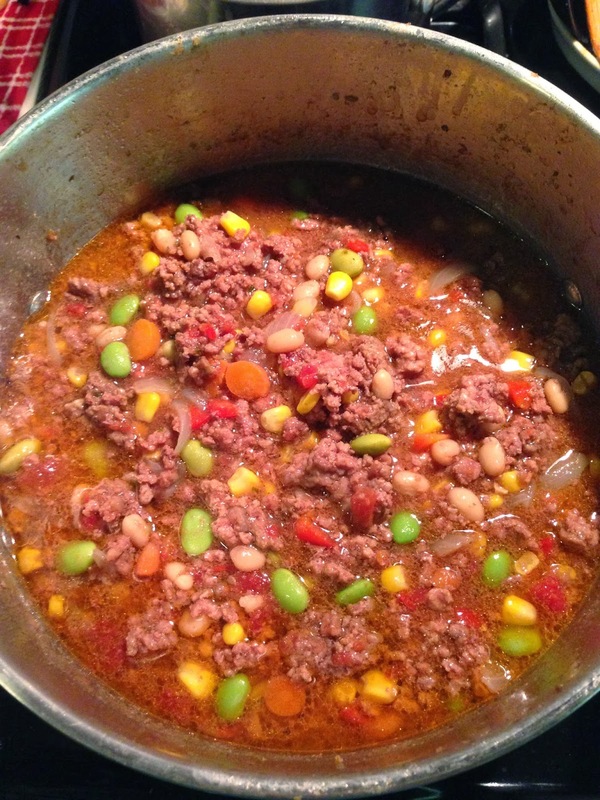 It won't be the best planned chili in the world, but it will certainly do the trick. And who doesn't love a warm, comforting bowl of chili for dinner while watching The Blacklist?! Chrissy and I are soooo into the new drama with James Spader. I started out with all these ingredients (minus the bread/bagels captured in the shot). 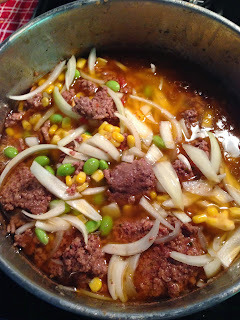 The ground beef and broth are not pictured, as they are simmering in a big pot on the stove. I then diced up a few of the veggies to get those working as early as possible. I find that I need to cook carrots for like 3 hours for me to enjoy them. These are the veggies I added first (red pepper, carrots and about half my onions), so they would cook the longest. I also poured the salsa in to cook with the meat. 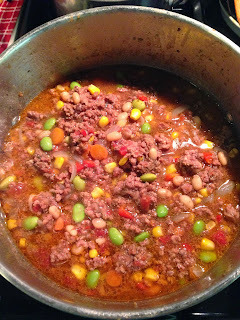 I then threw in the beans, edamame, corn and more onions a few hours later. 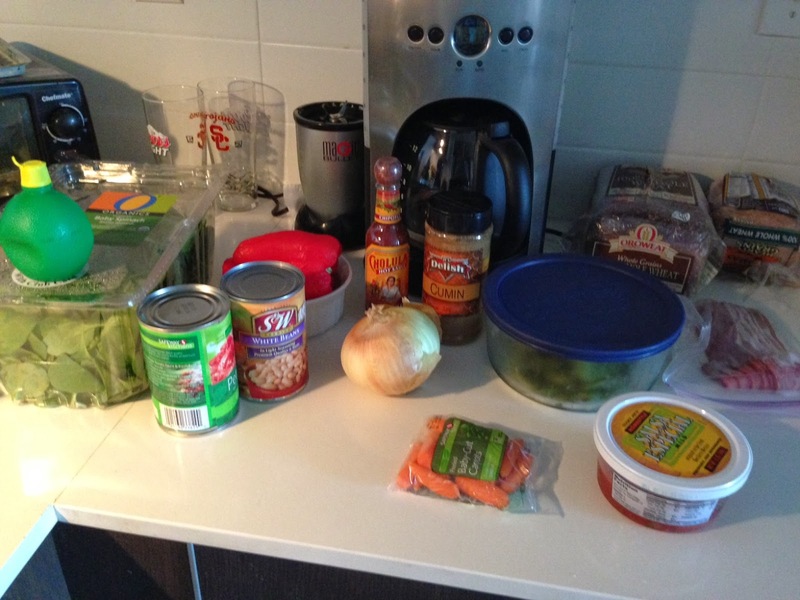 In total, it took about 2-3 hours to prep and cook the chili. I kep it simmering for a few more hours, I was just hungry and eager to try it! Here it is about 4 hours later. I also made some cornbread and took out all my toppings (and more seasonings since Jim can handle a little more kick than me). **Oh and hugely important -- don't forget to skim the fat off the top!!! Finished product. 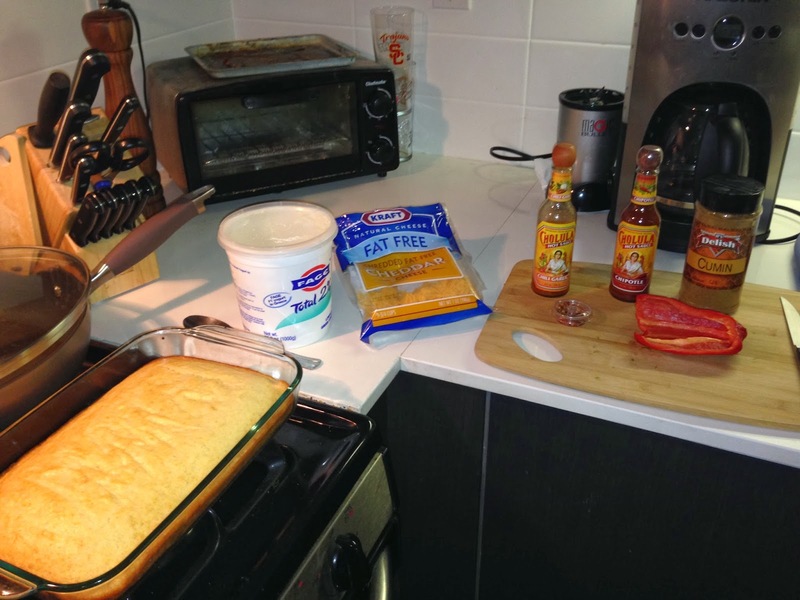 Cornbread on the bottom, then a few scoops of chili topped with low-fat, shredded cheddar cheese and greek yogurt. Yum! High protein, high fiber...just what I was looking for (oh, and an empty fridge too!). Success!